TESTHEAD: What Can A "Woggle" Teach About Testing? Since my Troop is gearing up for Scout Camp in just a couple of weeks, I've been spending a lot of time with my Scouts getting them ready for camp, including all of the various activities that go with that. Usually, this includes such things as making sure everyone has the necessary gear, that they have the books, the equipment, and the items that will make for a good week for everyone. In addition, one of my standard "traditions" is the making of "woggles" for each of the camp attendees. For those who have been Scouts, or have ever seen a Scout in uniform, you may notice that many of them wear a kerchief around their necks. The kerchief is usually held on by a slide of some sort. There are various items to be used as a slide, and my guys have make a number of them over the years, but I still say that the Woggle is the most useful slide because, in a pinch, it can be used for something else. Unlike a dedicated slide which is just a piece of ornamentation, a Woggle allows the user, if they need to, have a piece of 3 foot long rope that they can use for whatever purpose, emergency or otherwise, might call for it. 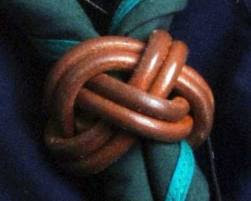 It's with this in mind that I have made these various Woggles (also commonly referred to as a "Turk's Head Knot") for my Scouts over the years. This year, I decided to teach them how to make one themselves. Over several years, I have gotten to the point where I can make these with my eyes closed, but that doesn't help my Scouts to make theirs if they need to, especially if they end up having to undo theirs in an actual emergency and then recreate it later. Thus I decided to sit down and show the boys how to make them. Easy enough, right? Well, not exactly! One of the reasons that I had grown to be able to make these Woggles easily is that I've literally made hundreds of them over the years. Repeated practice makes something automatic. The problem is communicating that "practiced automatic" technique to someone else. My experience showed that what was second nature to me, and thus very simple, was foreign and difficult to almost everyone else (adult and youth alike). Even when I broke it down to its simplest components, and walked them through the steps very slowly, it was not something I could easily explain or demonstrate. It took a considerable amount of time and many false starts before the people involved in my demonstration of tying a Woggle/Turk's Head were able to create their own. What was I doing wrong? I realized that I was trying to make everyone work with my view, that if everyone did it just the way I did it, it would be simple and everyone would be able to make a Woggle. Instead, I dealt with several frustrated boys and adults who had difficulty following my instructions and about half gave up in frustration and asked me to help them make them. Left to my own devices, I would do exactly that, but this time, i wasn't feeling so generous (not to mention that in this particular case, that is totally my M.O., to generally teach a skill, and then when the person in questions doesn't do it right, just take it out of their hands and do it for them). This time, however, I vowed I wouldn't do that, and I would talk through whatever it took to communicate how to create the Woggle. Through this effort, I realized that I have limits to my knot-tying vocabulary. There are many phrases used to describe the end of a piece of rope (the lead), a curve in rope (the bight) and the interaction between them to describe the knot in question. To those familiar with tying knots, saying a "three lead by four bight" Turks Head conjures up a specific image and method for making a woggle, but even with that terminology, it still doesn't get the neophyte closer to making a completed knot. The only way to get proficient at making a knot is to practice it, make mistakes, get frustrated, try again, perhaps repeat the scenario 3 or 4 or more times until the person making the knot has that "a-ha" moment and they can easily create the knot. After creating it, it takes practice to get smooth at the process, but keep at it, and the process does indeed become smooth (or at least smoother :) ). When we test, we often see a task as either easy or difficult, depending on our immediate viewpoint and history. For me, making a Woggle is easy, because I've done it more than a hundred times. For the neophyte, even with specific directions, it can be a challenge to make a good Woggle. Techniques likewise are very individual; not every person is going to follow the exact same steps the exact same way. Using my Turk's Head/Woggle example, there are several ways to make this item, and each one is as correct as the previous method. Likewise, there are many testers who will come to a problem with multiple solutions, each one potentially accurate, each one offering a solution. In making a Turk's Head knot, there are many ways to make it that yield the same results (and there are many ways to make it so that the net result is an entirely unusable item or a failure to finish creating it). Each of us had a need to create a framework for a problem, try out steps to see if we can determine if an approach works, and then use that knowledge to do the same steps again. Do it multiple times, and we can determine if an issue can be tested, just as we can determine if a particular approach will create our Woggle/Turk's Head. It's in the doing that we find out what works and what doesn't, so get out there and do :). For those who are interested in trying your hand at making your own Turk's Head knot, this is the method I most frequently use and describe. Nice post. What I see here in action is the difference between your experience level at tying the knot, and explaining it to someone who is new to it. Cockburn refers to this as the difference between the Ri-level expertise and the Shu-level introduction. It's hard for a Ri-level person to explain it on a Shu-level, since his knowledge, his skill acquisition has gone further, has broken free from the initial first steps. A teacher of mine used to give A- grades for students who could gather the knowledge, and a A or A+ for a person who could explain it to the others. Hi Markus, thanks for the comment and thanks for the Cockburn link. Very interesting, I've bookmarked this one :).